This weekend we performed the chromotagraphy tests on our Las Brisas Pinot Noir and Pinot Noir rose. I am happy to report that the Malo-lactic, or ‘Malo’ conversion is complete–right on schedule. Just like in the previous five years, by the time the first week of November rolls around, the little bugs have done their job. Basically wine contains a few different kinds of acids, Tartaric is one and Malic another. There are others but not in high enough quantities to be noticed. During malo conversion (also referred to as Secondary Fermentation) Malolactic bacteria eat away at the Malic acid and covert it to Lactic acid and Carbon Dioxide. Being about half as strong as Malic acid, Lactic acid is softer on the pallet. The total effect is reduction in total acidity and a rounder softer, mouth feel. For a real technical description see here. In my opinion it has been overdone in many California Chardonnays and I do not like it in that varietal. However, many red wines benefit and are enhanced by it, so we pursue it with our Pinot. In addition to the reduction of acid, it stabilizes wine and should be done before bottling. If you bottle before Malo conversion is complete, it might be triggered spontaneously when the weather warms up. This will put the bugs in motion, only this time while they are enclosed in a bottle. You will end up with ugly deposits, aromas and fizz that could potentially push out corks. Which gets me back to Chromatography, how do you know when ‘malo’ is done? At the winery we take a sample and send to the lab. A day later we get an email that tells us the Malic acid content in grams per liter. If it is under a certain number, i.e. .09 grams per liter, it is done! Easy. At home, we get to play Mad Scientist and do our own fun, chromotography test. Ben and I just did one this weekend and the image you see here shows the results. We dot a special paper with wine samples and reference acids (Tartaric and Malic in this case.) Then we put the paper in a special ‘developer’ liquid for 8 hours and watch the liquid travel up the paper. As it travels up it carries with it the different acids to different levels. Tartaric is at the bottom third, Malic is in the middle and Lactic is at the top. 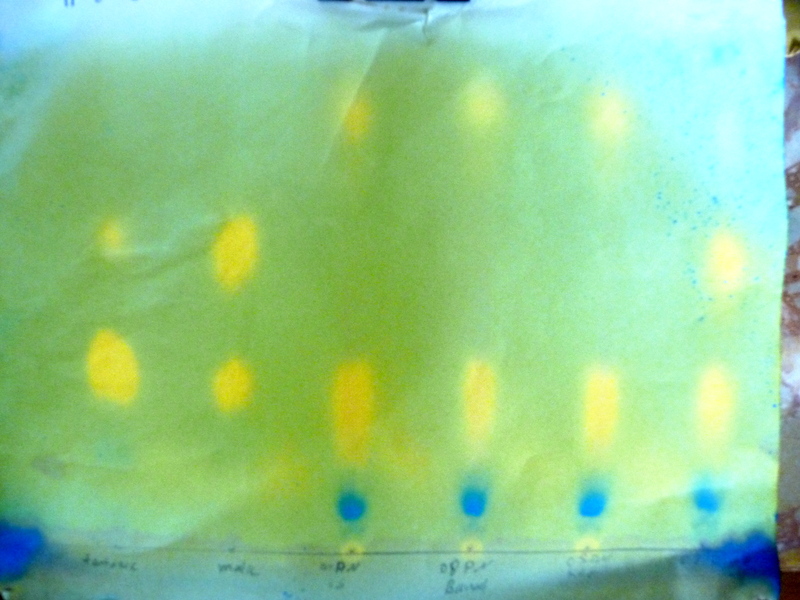 The acids from the wine sample travels up the paper as well. The test is to observe and see if the wine sample has a spot at the same level as the Malic spot. If it does, Malic conversion did not take place; if the spot is faint, it is only part way done. If there is no spot, Malo is done! Look at the image again. There are six columns. The spot in the far left column is the Tartaric reference; the second is the Malic reference; the third, fourth and fifth columns are the Pinot Noir samples from three different vessels; the last is our Pinot Noir rose. This means that Malo is done for the three Pinot reds–note there are no yellow spots at the same level as the Malic reference dot (mid way thru the paper hights). The Rose however, did not go thru Malo. This is a good thing because we like Rose more acidic, that’s what makes it more refreshing served chilled on a hot afternoon. If there are winemaker scientists out there wondering what the light dot above the Tartaric and the light dot below the Malic references are, well, my guess is that it is a bit of contamination from the reference solutions while I was preparing the tests. Unless someone else has a different explanation. I did not see these in previous years. In any case, whether malo conversion took place or not, it makes a nice piece of psychedelic, abstract art to hang on the cellar walls.